Microsoft's new Kin phones are not truly smartphones, but Verizon Wireless is charging users a minimum monthly $70 service fee anyway -- $30 alone for data -- over a two-year contract. Microsoft and Verizon representatives defended the fee on Tuesday, partly because of the Kins' automatic cloud-based backup of video, pictures and other data. Neither the Kin One nor the Kin Two has the ability to download applications and games -- taking it out of the realm of most smartphones -- but Microsoft said it plans to allow app downloads in a future version as services are merged with upcoming Windows Phone 7 devices. "Over the longer term, we'll be merging [Kin and Windows Phone 7] platforms and having downloadable apps," said Greg Sullivan, senior product manager in Microsoft's mobile communications unit. Critics have drubbed the new the new Kin phones for charging its mostly younger user base a $70 monthly minimum smartphone service fee over two years. Negative comments have flowed from bloggers and reviewers. Microsoft and Verizon view the Kin Windows phones as a new category of social networking phone, somewhere between a smartphone and a high-end feature phone. "We're introducing a new category that's not exactly a smartphone and certainly more than a high-end feature phone -- a social or cloud phone -- with a rich browsing experience and rich multimedia social networking, where everything I do on the phone is automatically backed up in the Kin Studio [in the cloud]," Sullivan said. Brenda Raney, a spokeswoman for Verizon, said that the Kin phones were "designed ... to be a full-service device [for] the person whose life is about networking." She said she has seen the critics' comments about the service plan costing too much added that Verizon has seen many users already paying $70 for a monthly smartphone plan for different devices. Raney said the Kins' biggest feature is backing up video files, photos and other data in the Kin Studio cloud, which is accessible via a Microsoft Silverlight-capable PC or Mac. That kind of backup will lead to plenty of Internet usage, which Verizon is trying to cover with the $70 fee, some critics have pointed out. Sullivan said customers will get used to that monthly charge. "Once they realize the value of this, they'll realize it's a great deal," he said. Even though Kin One and Kin Two do not support downloadable applications and games, there are built-in applications, including social networking apps like Facebook and Twitter; a Zune music player; and cameras, including an HD video camera in the $100 (after rebate) Kin Two. The Kin One, which costs $50 after rebate, puts both models at the lower end of the mobile phone hardware cost spectrum, but true smartphones such as the Palm Pre Plus can be purchased for $30. 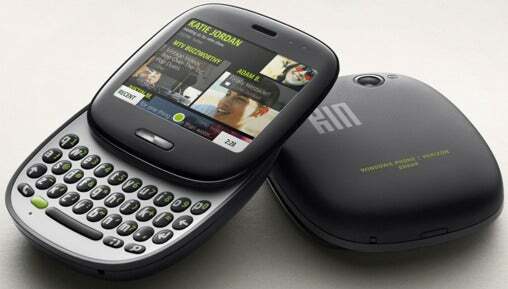 Microsoft's Kin One phone focuses on social networking. With a square shape, it has a 5-megapixel camera and 4GB of memory.